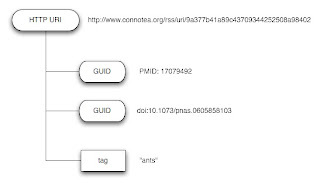 "This means that if two Connotea users bookmark the same paper, we could deduce that they are the same paper by comparing the embedded GUIDs." I think you say that it is OK for there to be a URL and a sw-unresolvable URN like a DOI or LSID for an object. I agree fully with this. Now as all these identifiers are opaque to the client the fact that the URL may embed the LSID/DOI doesn't matter. The client should not be able to differentiate between a URL that is a proxied LSID and a URL that isn't. It is just an http URL. So I don't see how you can logically criticize the use of LSID proxies and simultaneously support multiple GUIDs. They are functionally indistinguishable from the client side.